Today, 96% of libraries indicated that social media is of value to their organization. Social media helps you connect with students, build a brand and show your library’s personality to the campus community. It’s an effective way to let people know about new resources you’re offering or events you’ve got going on, and it can help you further your mission by connecting with students outside of the library’s walls. But how do you create an awesome, effective social media platform that engages students and faculty alike? Today, we’re taking a look at some of our favorite library profiles across social media platforms. The big kahuna of social media, Facebook is the number one platform for connecting with your campus community. Capable of handling hashtags, displaying images and connecting directly with people’s profiles, it’s a perfect place to show off your academic library’s offerings. For an example of stellar Facebook use by an academic library, check out American University Library’s page. Last week, they shared the winning entry for a video contest on why AU students love their library; and they have recently posted awesome staff profiles, a history of the university’s memorable commencement speakers, updates to their hours of operations and a congratulatory post for the University Library Research Award winners! Take a page out of American University Library’s (Face)book and fill up your profile with interesting student work, photos, events and library history. Even if it isn’t all about what’s happening on campus, an engaging page will bring in new patrons and endear your library to the Facebook audience. For a mix of classic California history, findings from a massive digital library and more pictures of monsters than you’d expect from the feed of a top university, check out the University of Southern California Library’s. Twitter account. Between promoting student-curated exhibits at the library and digging up quirky images from their digital collections, the USC Library’s Twitter account contains a plethora of offbeat, fun offerings that are sure to catch the eye of the average Twitter user. We’d be remiss if we didn’t mention the Orkney Library as an example of a great library Twitter account. Even though it’s a public library, the librarians in Orkney have fun on Twitter, showing off their personality and literary offerings through a quirky, tongue-in-cheek feed. Check them out if you need some inspiration on how to advertise your current offerings or jazz up your social media presence—or if you need to learn to dance with cats. Struggling to represent your library through pictures? Check out Brown University Library’s Instagram for inspiration. From letting students know about the newest and strangest offerings they have available (including the mysterious “Brain Research, vol 27”) to photographing the strange things students leave between the stacks, the personality of this academic library shines through. In order to make the best use of Instagram, think about how you can represent your library visually. Whether it’s through bizarre covers for some of the more offbeat books in your collection or keeping students up-to-date on renovations or new additions to your resources, Instagram is the platform to show students what you’re up to. 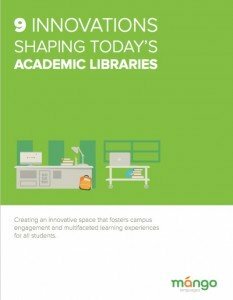 If you’re looking for other ways to keep your library up-to-date and cutting-edge, check out our checklist of the 9 innovations changing up the academic library space!